When Kaneka was founded, our main product lines included caustic soda, soap, cosmetics, edible oils and electric wiring. But as Kaneka grew, we started to concentrate on Research and Development and began looking ahead to the rapidly changing global market. Today, Kaneka's main product lines include chemicals, functional and expandable plastic products, foodstuffs, life science products and synthetic fibers as well as solar energy modules. Kaneka researches, develops and manufactures its own solar panels leveraging our advanced materials knowledge and our core competency as a chemical manufacturer for over 60 years. Solar energy division is part of the electronics products. 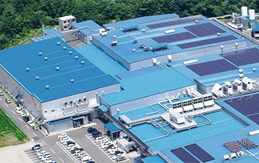 Kaneka has been specializing in thin-film silicon technology with synergy of our unique chemical technology. We keep offering state-of-the-art technology and we keep on developing.